At Skach Manufacturing Company, we are often able to provide customers with a low cost alternative to the screw machine process. The part shown is used in the scientific and medical industry. 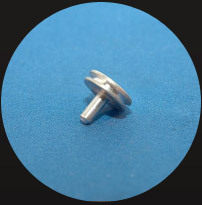 This stud was originally manufactured using a screw machine process. 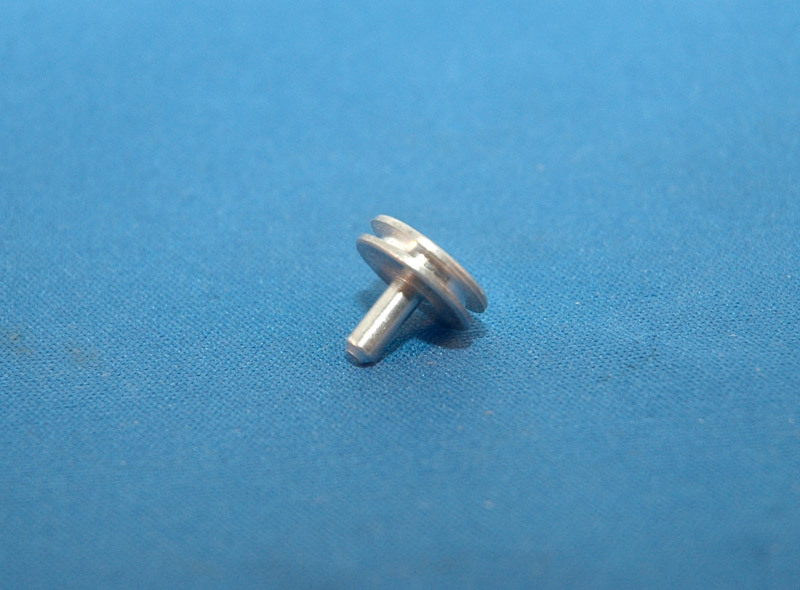 A large amount of aluminum waste was generated due to the difference between the head and the shank diameters. Skach designed a cold forming process that uses a multi-station heading machine to form the blank. This process eliminated the bulk of the waste material and met the tight screw machine tolerances. A secondary grooving (trim) operation was required to complete the stud. The stud is finished in a tumbling operation to provide a uniform finish on the surface of the head. All production operations including tooling were performed in-house. In-house capability means quick response to any part design or production schedule changes. If you have a part with large differences in diameters, contact Skach directly to learn more about reducing costly material waste. Cold Forming conversion of a screw machine part with a secondary Shaving operation.